Simiyu is a boy who we rescued off of the streets last year. His mom died some years ago, leaving him with his dad. Then dad was sent to jail for crimes he was involved in. That’s how he ended up living on the streets. We saved him from the streets but since then Jesus has saved him from an eternity without being in the presence of a beautiful, loving, awesome God. We are so happy for him. We thought that Simiyu’s dad was going to get released soon from jail, but instead we haven’t heard from him for a while now. 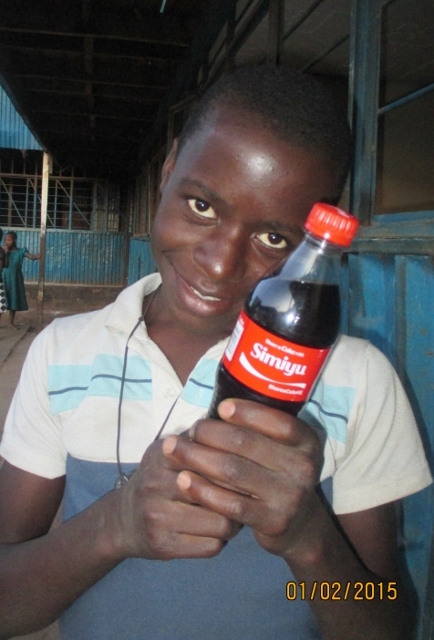 Simiyu loves the street kids that he used to live with. So much so that one time he stole a small cooking stove from the school that was used as a bunsen burner there. He took it to the kids on the street so they could use it to cook. Needless to say the school wasn’t happy about that. Simiyu tried to retrieve it from his friends but to no avail. He said he told God he was sorry and that God forgave him. And indeed He did. I told him how wonderful it is that he cares about the boys on the streets so much, but he can’t be a Robin Hood, then I had to explain to him who Robin Hood was. Simiyu is a precious soul who is always smiling and is so happy t be in a good place and going to school. We love him and are very grateful for the help of people to help us care for him. The following video is kind o a rough one of him saying thank you too. His ability to speak English is steadily growing. God bless you.